How I was able to track the location of any Tinder user. Tinder is an incredibly popular dating app. 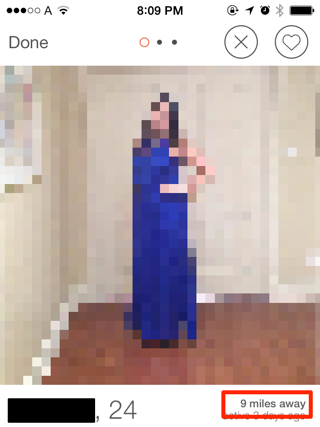 It presents the user with photographs of strangers and allows them to "like" or "nope" them. When two people "like" each other, a chat box pops up allowing them to talk. What could be simpler? Before we continue, a bit of history: In July 2013, a different Privacy vulnerability was reported in Tinder by another security researcher. 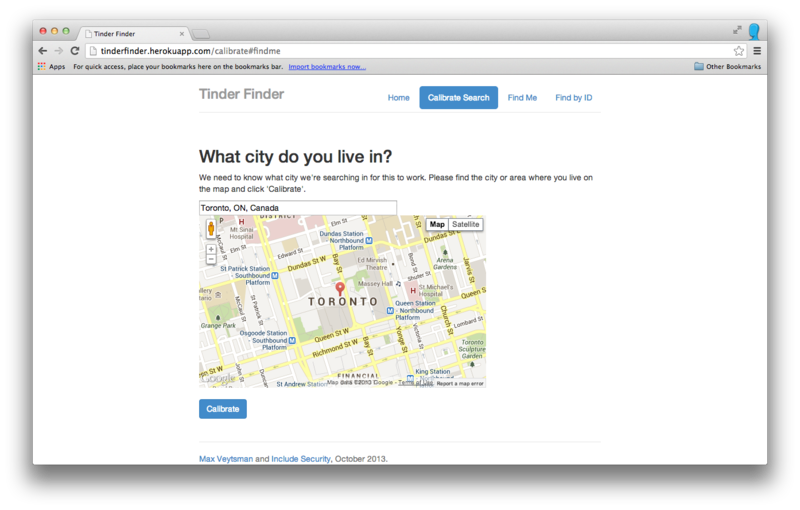 At the time, Tinder was actually sending latitude and longitude co-ordinates of potential matches to the iOS client. Anyone with rudimentary programming skills could query the Tinder API directly and pull down the co-ordinates of any user. I'm going to talk about a different vulnerability that's related to how the one described above was fixed. In implementing their fix, Tinder introduced a new vulnerability that's described below. 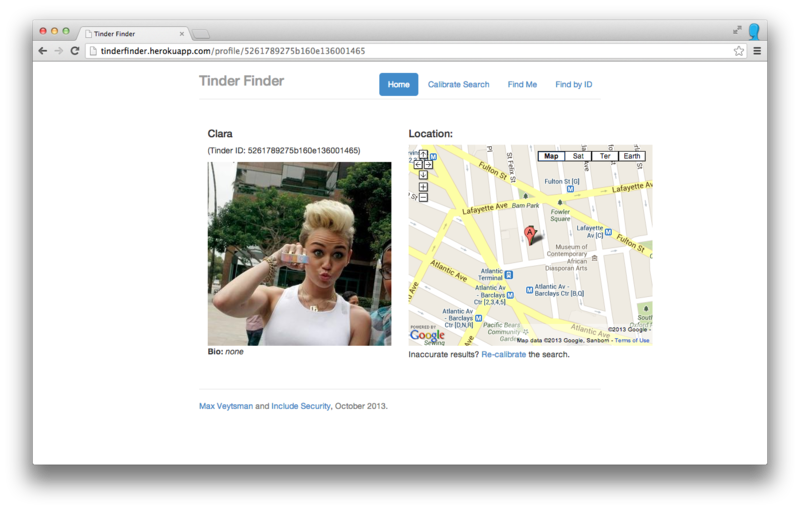 By proxying iPhone requests, it's possible to get a picture of the API the Tinder app uses. Of interest to us today is the user endpoint, which returns details about a user by id. This is called by the client for your potential matches as you swipe through pictures in the app. Tinder is no longer returning exact GPS co-ordinates for its users, but it is leaking some location information that an attack can exploit. The distance_mi field is a 64-bit double. That's a lot of precision that we're getting, and it's enough to do really accurate triangulation! As far as high-school subjects go, trigonometry isn't the most popular, so I won't go into too many details here. Basically, if you have three (or more) distance measurements to a target from known locations, you can get an absolute location of the target using triangulation1. 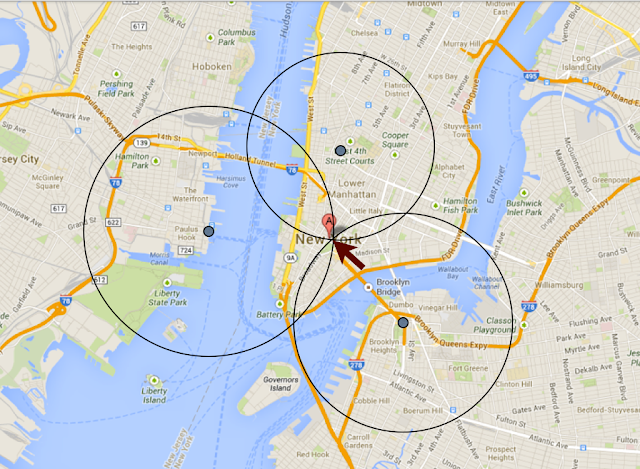 This is similar in principle to how GPS and cellphone location services work. I can create a profile on Tinder, use the API to tell Tinder that I'm at some arbitrary location, and query the API to find a distance to a user. When I know the city my target lives in, I create 3 fake accounts on Tinder. 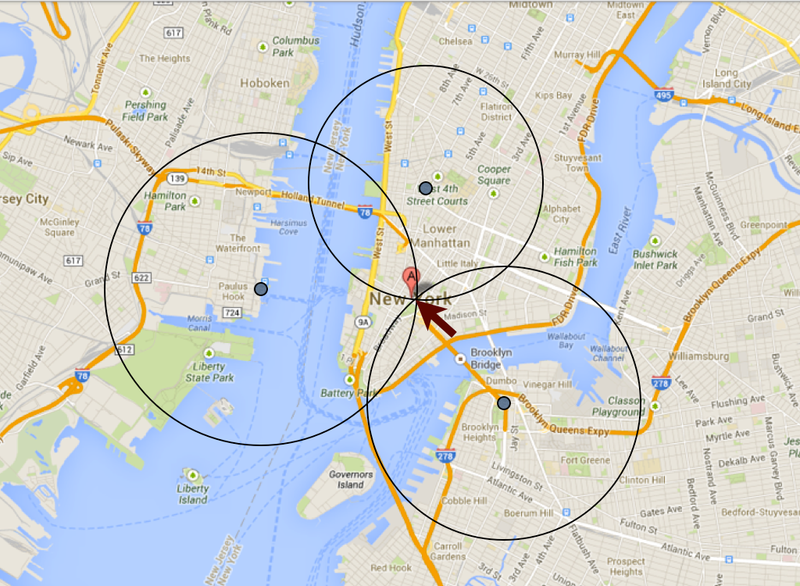 I then tell the Tinder API that I am at three locations around where I guess my target is. Then I can plug the distances into the formula on this Wikipedia page. Before I go on, this app isn't online and we have no plans on releasing it. This is a serious vulnerability, and we in no way want to help people invade the privacy of others. 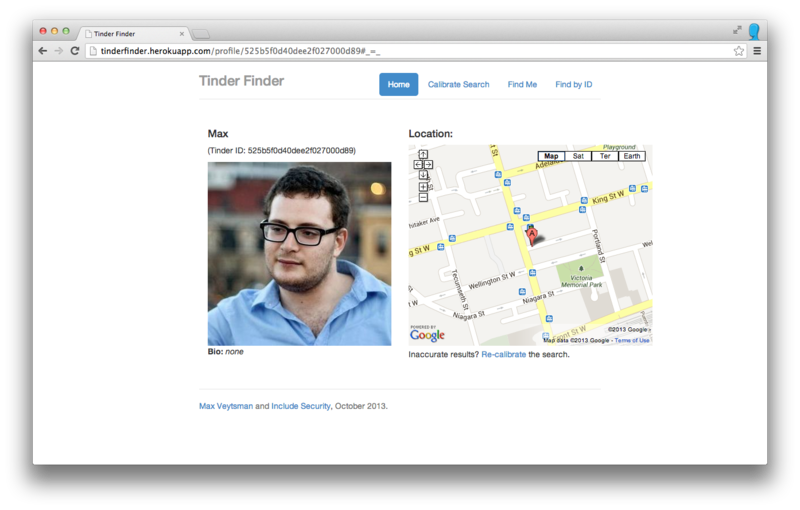 TinderFinder was built to demonstrate a vulnerability and only tested on Tinder accounts that I had control of. 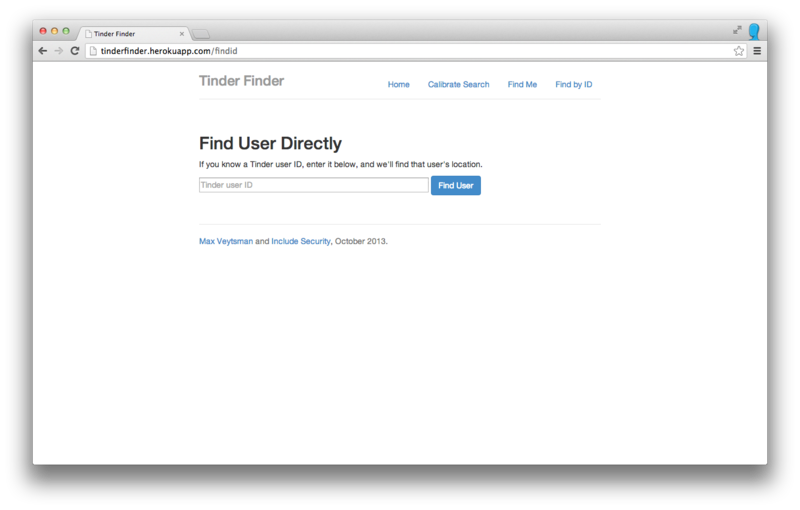 TinderFinder works by having you input the user id of a target (or use your own by logging into Tinder). The assumption is that an attacker can find user ids fairly easily by sniffing the phone's traffic to find them. First, the user calibrates the search to a city. I'm picking a point in Toronto, because I will be finding myself. Q: What does this vulnerability allow one to do? Q: Is this type of flaw specific to Tinder? A: Absolutely not, flaws in location information handling have been common place in the mobile app space and continue to remain common if developers don't handle location information more sensitively. Q: Does this give you the location of a user's last sign-in or when they signed up? or is it real-time location tracking? A: This vulnerability finds the last location the user reported to Tinder, which usually happens when they last had the app open. Q: Do you need Facebook for this attack to work? Q: Is this related to the vulnerability found in Tinder earlier this year? A: Yes this is related to the same area that a similar Privacy vulnerability was found in July 2013. At the time the application architecture change Tinder made to correct the privacy vulnerability was not correct, they changed the JSON data from exact lat/long to a highly precise distance. Max and Erik from Include Security were able to extract precise location data from this using triangulation. Q: How did Include Security notify Tinder and what recommendation was given? A: We have not done research to find out how long this flaw has existed, we believe it is possible this flaw has existed since the fix was made for the previous privacy flaw in July 2013. The team's recommendation for remediation is to never deal with high resolution measurements of distance or location in any sense on the client-side. These calculations should be done on the server-side to avoid the possibility of the client applications intercepting the positional information. Alternatively using low-precision position/distance indicators would allow the feature and application architecture to remain intact while removing the ability to narrow down an exact position of another user. Q: Is anybody exploiting this? How can I know if somebody has tracked me using this privacy vulnerability? A: The API calls used in this proof of concept demonstration are not special in any way, they do not attack Tinder's servers and they use data which the Tinder web services exports intentionally. There is no simple way to determine if this attack was used against a specific Tinder user. October 23rd 2013 - We notified tinder via email to customer service. October 24th 2013 - We notified tinder via email to CEO. October 24th 2013 - Tinder's CEO acknowledges and says thanks. November 8th 2013 - We ask for status from the CEO, no response. December 2nd 2013 - We ask for status from the CEO, we're redirected to a tech team lead. December 2nd 2013 - Tech team lead asks for more time to implement a fix, we acknowledge and agree. January 2nd 2014 - We ask for fix details/status from the tech team lead, no response. February 4th 2014 - We ask for fix details/status from the tech team lead, no response. February 7th 2014 - We ask for fix details/status from the CEO, get short reply saying they'll get back to us. February 19th 2014 - As the issue does not seem to be reproducible and we have no updates from the vendor....blog post published.